I have a habit of becoming super-enthusiastic with the arrival of each new season, but I really can't contain myself with this one. Spring has sprung, and I couldn't be happier! There's only so many cold and rainy days I can take in a row, before they stunt productivity and see me dreaming of beaches. Speaking of which, at some point in the far future I can definitely see myself moving somewhere with a much warmer climate all year-round. Anyway, with the seasonal-wardrobe changeover complete and the prospect of bare legs being justifiable after many months undercover, I've shown some love for double denim styling - the subtle way! There's something about spring that immediately turns me towards pale denim, which explains why this perfect denim skirt has been my go-to piece over the past fortnight. My opinion of H&M goes up and down, but this skirt gets a massive thumbs up from me, especially thanks to the raw-edge hem. Come to think of it, following on from my Meeting Styling, I have a bit of a 'thing' for unfinished, raw hemlines! Back to the concept of double-denim, these heels from Deichmann are part of the Ellie Goulding Star Collection; the minimal design is totally up my street and they're SO comfortable to walk in. Psst! The coral lipstick worn in this look is Charm by Mii Cosmetics. For more details read my review of their new Spring collection - Cherish Mii. Wherever you are, I hope you've also had such beautiful weather lately! I'd love to hear your thoughts on this look; how do you feel about double-denim styling? honestly every time I go into H&M right now I look at that skirt, I just need to get it already, it really does look amazing on! Love this look! Simple and elegant! Luci’s Morsels | fashion. food. frivolity." I’m not a fan of the Canadian tux so this look is perfect double denim in my books! Love the subtleness of it. Those denim heels are perfect & I love how you styled it with a slouchy jumper. I always love a good double denim look, and I adore your take on the combination here! This really is gorgeous Gabrielle, you look fantastic! I am a big fan of denim and double denim, and the twist you put on double denim here is very refreshing and spring like. The heels are great, but probably a tiny bit too high for me to walk in them comfortably. Just like you, I see myself in the future, living somewhere with a much warmer climate all year-round. Beautiful outfit! Perfect combination !!! This outfit is ultra chic and effortless, Gabrielle! Btw, your hair is getting so long!!! You're making me want to grow it out like that now! I don't think you should ever donate that jumper, it suits you so well, also, I love your take on double denim, those shoes are stunning and I agree, H&M are sometimes really great with a winning piece like your skirt. You look beaut and that denim skirt suits you perfectly! Also you definitely shouldn't donate that jumper, it's such a classic. H&M goes up and down in my opinion too - sometimes they have everything I want and others they don't have anything - that skirt is a gem though! Such a beautiful outfit! Also, your hair looks so good in these photos! Gabrielle, I share your enthusiasm when a new season begins! You look beautiful. I love the design of that denim skirt. It's so modern. Love your heels & accessories. They perfectly compliment your outfit. I love how you subtly did the double denim trend and love the heels! I need to give denim heels a try, you look amazing with that pair. I like these shoes with your denim skirt, Gabrielle, you look amazing. Super lovely look! Great styling! I love the bag and the shoes! I really like your denim skirt! It looks great on you and you styled it perfectly. I think that a nice denim skirt is a priceless item in every girl's closet. Awesome top...and lovely denim sandals. I really love this outfit! The denim skirt is so stylish! Such a beautiful look. Where the hell have I been, I had no idea Ellie Golding has a collection with Deichmann shoes. Must check those out! Thanks for advising Gabrielle. This is indeed a very subtle - but smart - way to style double denim! I'm not the biggest fan of denim myself, although denim skirts can be really pretty and great to style in the spring. This jumper is a good basic as well, you were right to keep it as white knitted jumpers are always good to have no matter what the season is! I am in love with those denim shoes...they are really stylish. 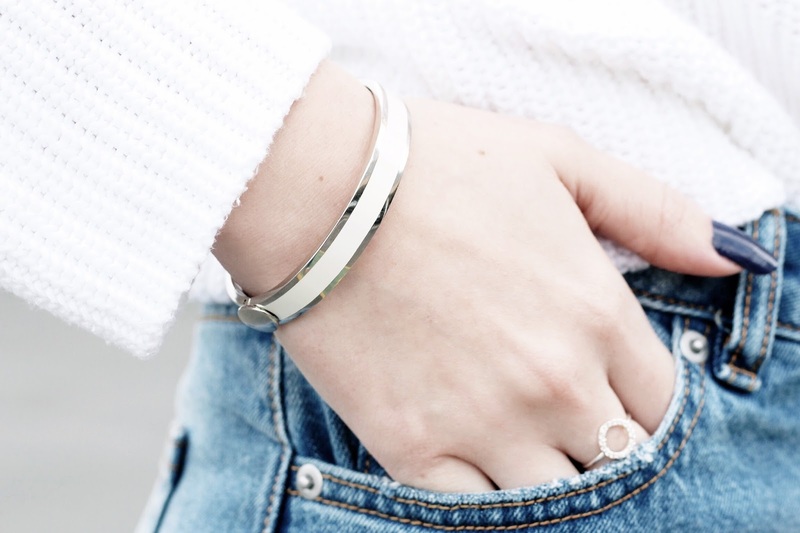 This is such a fantastic way to layer denim. Everything is in the subtlety! Perfect double denim and always so chic! Love the change of the seasons with spring being my favourite one! Beautiful look with the denim skirt & shoes! Gabrielle you look gorgeous! I love the skirt so much. The white Ralph jumper is just gorgeous and teams so nicely with the skirt and heels. What a lovely Spring look! Beautiful shots! You have such an infectious smile lady! That skirt is super cute and actually looks higher end. Reminds me so much of what I would wear in the 90's haha. Crazy! I tend to reach more for lighter denim too come spring, it just exudes the season more and pairs so beautifully with lighter colors and pastels! That said, I absolutely adore your skirt! It looks so cute on you, I love the hem and how you've styled it with the white jumper and chambray sandals! Thanks so much for sharing, beauty, and I hope you're having a great week so far! Well, definitely you master the doubel denim trend, Gabrielle! Super lovely and stylish outfit, In love with thos amazing sandals! Such a fresh, chic, spring look! Love your outfit, Gabrielle! You look amazing! You look so lovely! I am really getting back into denim now, it is such a nice look. I love this subtle way of doing denim on denim!!! The skirt looks just perfect on you and the shoes are gorgeous!!! I love the skirt and how you styled it! Hi, You have made my mind up....yes I love it!!!!!!! This is such a fun way to do the double-denim trend!! I've never actually seen denim heels before but now I'm obsessed! I love your outfit, so lovely ! Denims are so great with white. I love your skirt so much. 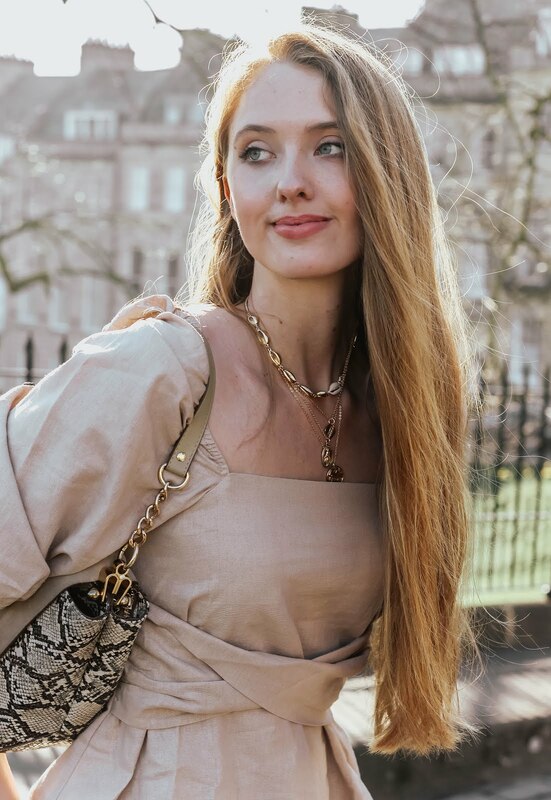 Such a nice spring look. You look so beautiful! I love this skirt! I actually tried it on at H&M and instantly fell in love! I am glad you didn't donate that jumper because it goes perfectly with your skirt :) Have a lovely weekend! First of all, you look stunning! The sun on your hair, so gorgeous! And this outfit is so classically beautiful. I love the denim skirt and the distressed hem. So cute! I've always been a fan of white and denim combination. I love how your look has this fresh, fun, playful vibe going on. I love your shoes! It has a classy design but the denim added 'fun' in it. I think double denim is much better when it's subtler, like your outfit. Hi Gabrielle, you look gorgeous in this skirt. And I love those heels. But the most beautiful accessory is your smile. I agree that denim works so well in the warmer months! It can lend a nice casual feel, yet here you styled it in an unexpected way. I love the way the heels work with the denim skirt. Also, I gotta say your hair looks absolutely GORGEOUSSSS styled like that! How did you get those perfectly messy waves?? Thanks so much Andrea! Funnily enough, these form whenever I try to curl my hair - the loops tend to fall out after a few hours and leave messy waves! I'm so happy spring is here as well =o) Love the denim skirt! You look so gorgeous as always! I love this outfit on you, your jumper is gorgeous. I love how well your shoes go with your bag too. Such a stylish outfit. Admittedly, I'm not the biggest fan of denim skirts usually but the split in this one makes all the difference in my eyes - completely transforming an item that you might usually see on Mums into something so much more! The fresh white jumper and the matching shoes really pull everything together for the perfect Spring look! Great styling dear! 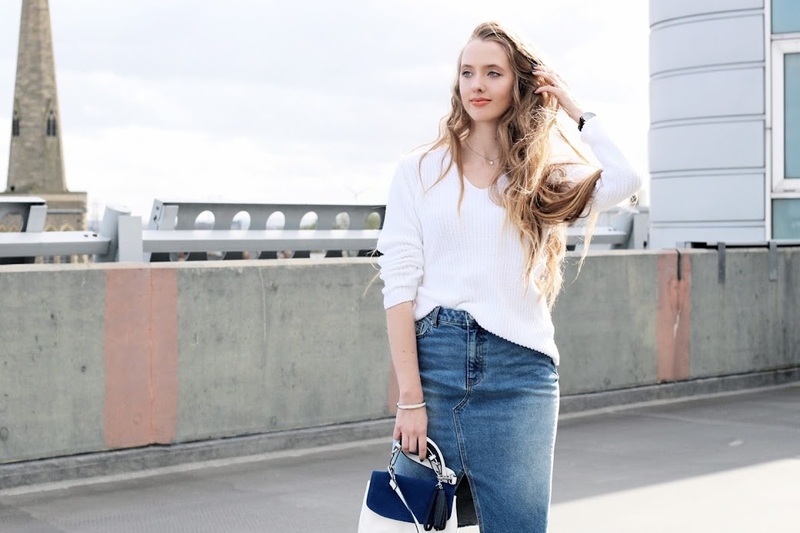 This double denim and white jumper looks fresh so perfect for spring. Love the cute bag and the matching heels! I love your take on double denim. I can't believe those shoes are from Deichmann. I haven't shopped there for ages. I really need to check out the latest collection. Lovely pair of shoes you got here, Gabrielle! That denim skirt is beautiful too and the hem is a nice detail. You look so pretty! And this outfit looks great! What a MODEL! Amazing look, Gab! Love the denim skirt on you! You’re inspiring! L-o-v-e the skirt with the touch of denim on the heels! Love the outfit Gabrielle! !1 So perfect for summer and spring!!! Molto bella nella tua semplicità! These photographs of you make me smile from within. You truly are a remarkable beauty on the inside out.